The American Civil War was a regional split in culture (economic, social, and political systems). At the outset, Unionist fought to preserve the American political system and Confederates fought against invasion. As the brutality of the war intensified differences developed; Northerners demanded the abolition of slavery and Southerners sought to maintain their culture as a separate nation. To understand Sherman's march is to come to terms with this enduring understanding. This was war at its most brutal; war as "hell." Tired of a war that seemed to have no end Sherman went about not just defeating the confederate army but literally destroying the south. Marching through Georgia and the Carolinas his troops destroyed railroads, burned farms, crops, and cities. Freeing slaves as he went, he left the areas he passed through unable to feed themselves. This was total war. This was a new kind of war that would be reflected later in Europe. While many northerners may have been ambivalent about ending slavery at the beginning of the war their feelings changed as the war dragged on. With the march, the destruction, and special field order #15 giving prime land to the slaves, this was more like the end of the end rather than the beginning; a clear turning point in the lives of everyone it touched. The sources I have selected allow this key event to be seen through three different perspectives; the union army, the southern citizenry, and the slaves. Each view is strikingly different in expectation and realization. Allowing these voices and images to "speak" from the past allows us to empathize with Americans caught up in one of histories turning points. The students will write an Extended Constructed Response (multi-paragraph essay) explaining how Sherman's march was a turning point in American history changing in all social classes both peoples attitude towards war and towards their own country. Unit 8.4 "A Nation Divided and Rebuilt: 1840-1877"
Lesson Sequence 3 "Fighting for Control: 1861-1865," content focus includes significant leaders of the war, turning points of the war, and that soldiers on both sides (and civilians) experienced extreme hardships and often held differing views about the goals and purpose of the conflict. Barnard, George N., Barnard's photographic views of the Sherman Campaign, ca. 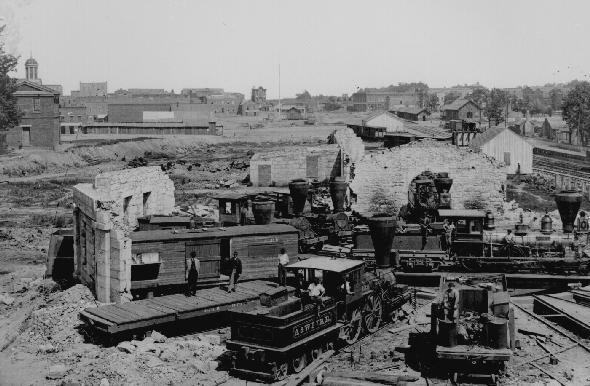 1866, "Rebel works in front of Atlanta, GA No. 1, 2, and 3"
Sheet music to "How Sherman’s Veterans Took Atlanta" by James Gay. This lesson is designed to take three days. It should be taught concurrently with regular instruction that would cover that time period. These activities should take about half the class. The regular curriculum should take the other half. Each day is designed to cover one point of view about Sherman’s march. The first day sites Union sources, the second Southern, and the last the slave perspective. The materials for each day should be distributed to the students the night before. All students should take the material home and read it. Some time must be allotted at the end of the previous class to discuss each primary source. The class period before Day 1, pass out all the materials for day 1 to the students. Allow 15 minutes at the end of class to discuss and put them into context (activate prior knowledge). The diary is from a member of the Ohio Volunteer Infantry. Without reading the diary in class ask the students what/how that person might feel marching though the south. Emphasize how intense regionalism was then and that they had certainly never been that far south or that far away from home. Have them examine the pictures. Briefly discuss that this was one of the first wars where photojournalism was used and what it must have been like to be a war photographer. Have them review the words of the song for any unfamiliar words. All materials should be read before Day 1. Have the students examine the photographs of the confederate fortifications. Ask them to describe them and their function. Do a close reading of the song lyrics. Discuss how it reflects feelings about the union, the south, and Sherman. Give the students time to fill out the diary work sheet in class. Discuss what ideas the Platter diary reflects; about the south, about destruction, total war. Using his own words what does he see? How does he feel about it (this requires some inference, have the students examine his choice of adjectives). Pass out materials for Day 2. Explain that all the diaries are from southern women. Ask them to try to empathize with them as they read that night; how they would feel about Sherman, the war, the confederacy. Start with the pictures. What do they show? Why destroy the railroad tracks? Have the students complete the worksheets for the diaries. Discuss what the say. What did they expect the troops to do? Were their expectations met? What did Sherman’s troops do? Why was this necessary? Why was there a need for total war? How did it affect the south? What did it mean for the future of the union when it would be rejoined? Pass out the materials for Day 3. Ask them to imagine the impact Field Order Number 15 would have (activate prior knowledge). Ask them what a slave's life would have been like before and what might they do with their new found freedom. Give them context for the other two readings; one a former slave who was 5 when Sherman came through, the other a woman who owned slaves. Discuss Field Order 15. Why did Sherman give it? What was the impact on his troops, the south, and the slaves? Have the students complete the worksheets for the readings. Discuss the different perspectives the two readings give. What did the future hold for them? How did Charles Green feel about Sherman? Who do they think John Morgan is? What did he mean when he said his Father "joined up" with Sherman? Create an outline to guide the students through their Extended Constructed Response (multi-paragraph essay). Taking the different perspectives presented in the lesson have the students list ways Sherman's March changed their lives; what was Charles Green's life before, what was it like after, etc. Extensions: The lesson can be further enriched by having the students do journal entries. After each class ask them to write an imaginary journal entry. Have them choose one of the people they read about and write what they think would happen next. There are several readings for each day. Depending on the reading levels of the students it can be varied. All students do not have to do all the readings. They can be divided up into groups. The students will write a multi-paragraph essay (Extended Constructed Response) addressing how Sherman's march was a turning point in American history. It should include a well written thesis statement with a clear point of view. It should address how this event changed the lives of all southerners; plantation owners, working class, and slaves; feelings the regions (north and south) had for each other; and the impact on war itself. A Rubric is included. "Civil War Song Sheets," Series 1, Volume 2. "How Sherman's Veterans Took Atlanta," by James D. Gay, Philadelphia, Pennsylvania, 1864, Rare Book and Special Collections Division, Library of Congress. Barnard's Photographic Views of the Sherman Campaign, ca. 1866, New York: Press of Wynkoop & Hallenbeck, 1866, Hargrett Rare Book and Manuscript Library, University of Georgia Libraries. The History Place, "U.S. Civil War Timeline"